ITEP (Inka Trail Expeditions Perú) is dedicated to providing high quality travel experiences that preserve the fragile lands we visit. By working closely with our customers, we are able to design unique vacations that match their interests and schedule. In addition to customized private tours, our specialty, we also offer pre-set departures. In 2007, William Escalante Taipe from Cusco, Perú founded ITEP (Inka Trail Expeditions Perú), South América Tour Operator, with nothing more than a strong desire to create an authentic Peruvian Agency, the rich diversity of tradition, adventure and mystery makes Peru a fascinating country to visit. Many Foreing Operators take advantage of this, but this Travel Agency was born in Cusco, Peru land of the Incas. ITEP (Inka Trail Expeditions Perú) There is something for everyone and more of what you're looking for .... discover lush landscapes in a sustainable tourism experience like nothing else in the world had ever seen. We offer an alternative adventure travel for cruises and bus trips are used to, not only want to change the way how the people look for adventure holidays time, but also show that travel within Peru, are unforgettable and will mark lifes forever through our social projects (SmileTerra) that these are full of Energy and Natural adventure. is an inherent belief to the core values that inspire our being and business today. 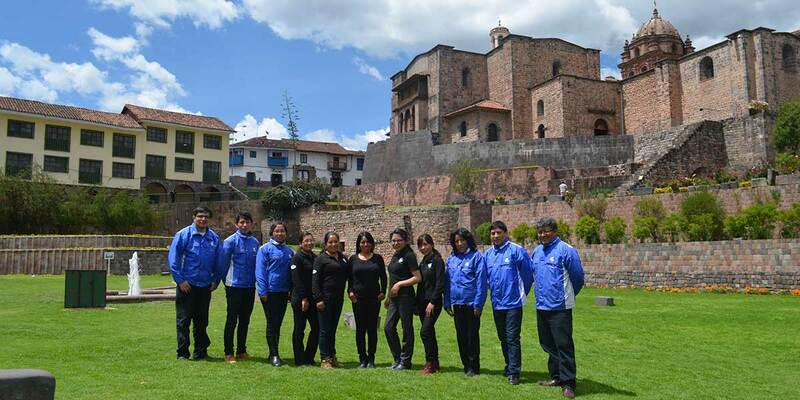 We employ a staff of knowledgeable travel professionals at our Lima headquarters and have long-standing contractual relationships with our logistical specialists in Peru who help develop and coordinate our tours. All have traveled extensively or lived and worked in our destination countries and share a common business philosophy and environmental ethic. Salkantay Trek limit the size of our tour groups to eight travelers, except on Galapagos Island cruises and tours where yacht capacity determines occupancy and on the Inca Trail where twelve travelers is the maximum. This policy offers several benefits. It minimizes our environmental impact, allows us to travel to areas less visited and makes the sightseeing experience more personal. It allows our guides sufficient time to attend to the individual needs of each visitor. Traveling in small groups also increases the likelihood of encountering wildlife in areas such as the Amazon. Salkantay Trek, We personally inspect the rooms and amenities of all potential hotels and lodges in each tour location and select only those that meet our rigorous standards for cleanliness, comfort, convenient location, safety, customer service and ambiance. We give the same scrutiny to the safety and quality of the yacht services we contract with to conduct our cruises. We support lodges and hotels that employ sustainability practices and are owned and operated locally. We contract with guides who are native to the destination and are licensed and/or certified in accordance with the government regulations of their country. All are fluent in Spanish and English and some also speak the indigenous language of the region. Many are medically trained and some have received additional wilderness medical training in the United States or other locations. To ensure the safety of our travelers, our guides are linked with outside services 24 hours a day in most locations to provide assistance when necessary. Ours is a team of knowledgeable and congenial guides whose priceless insights into the true nature of their homelands add immeasurably to the enjoyment of the trip. For many travelling abroad opens our eyes to a world that is very different from our own and inspires us to help make a difference in the lives of people and communities that we have visited. Whether you have recently returned home from travelling, or you just genuinely wish to help make a difference in the world around you, you can help by making a contribution to our (Social Proyect Smile terra), the non-profit founded by Salkantay Trek. ITEP (Inka Trail Expeditions Perú), Our company and all those who represent us abroad practice environmental stewardship based on the Leave No Trace philosophy. We travel in established National Parks and conservation areas, leaving only footprints and taking only photographs. We select camping locations with the most benign sanitary systems, pack in gear and foods with the least waste feasible and properly dispose of all rubbish. We design all of our trips to minimize travel times and take full advantage of local hikes and walking routes. In this way, we decrease reliance on motor transportation, and enable our clients to become more intimate with places they travel. We donate to organizations dedicated to the conservation of the ecosystems in which we operate to carbon-offset the use of natural resources that our trips cause. Because we believe sustainability applies to economic and social well-being in addition to environmental health, we make sure our tours directly benefit the locations to which our clients travel. We support local organizations, non-profits, and schools to improve the quality of life in the areas through which we travel. We employ native guides, porters, and logistical members of our staff, as well as supporting locally owned and operated hotels, lodges and restaurants. We also ensure fair wages for all with whom we work and contract. This commitment has created enduring relationships with members of our international team and greatly added to our clients' experiences abroad. At our Seattle headquarters, we employ best environmental practices in our daily work. Our energy-efficient office is purposely located within walking distance to all of our major needs to minimize trips by car during our workday. We encourage our employees to use alternative forms of transportation, and some bike or walk to work daily. We have made efforts beyond simply using recycled paper products by making our company nearly all web and computer-based. We mail only the essentials to our clients, communicating predominately by waste-free email and phone. Additionally, we email newsletters and rely on our website to notify travelers of updates instead of mailing brochures that are paper intensive. Each year, ITEP (Inka Trail Expeditions Perú) hosts a Christmas Party in Cusco. committed to sharing the spirit of Christmas giving and participates in activities distributing presents, meals, hot chocolate to children.. We continually seek new ways to actively support sustainable tourism.